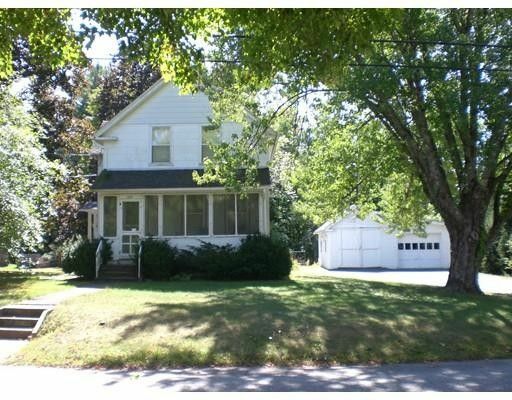 Charming colonial on nice level lot is waiting for it's next owner! Detached garage with attached work area and separate wood shed for extra storage. Step into a large bright eat in kitchen with a pantry and plenty of room for your goods. Full bath with old fashion claw foot tub! Open dining living room currently being used as a bedroom. Beautiful wood work throughout house with 3 bedrooms and 2 walk in closets! Elegant stairway with a pretty stain glass window. Enjoy sitting on the front porch or relax out in the back yard and plenty of room for your gardens. Newer roof and furnace with recent vinyl flooring in kitchen, bathroom, pantry and mudroom. Home needs tlc, cosmetics and painting but has so much potential. Convenient location just off Rt 32.